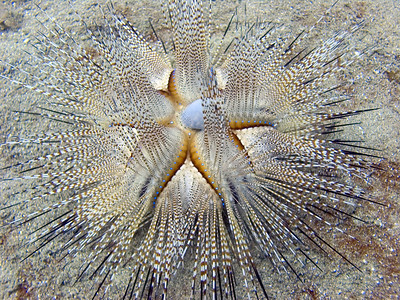 Sea urchins and other spiny invertebrates. 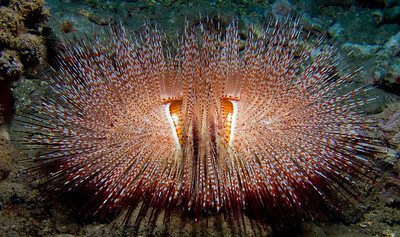 A blue-spot sea urchin (Astropyga radiata), showing how beautiful radial symmetry can be. 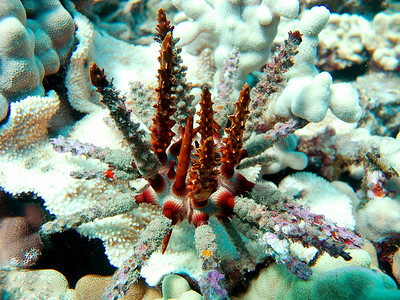 Color version of the same abstract. 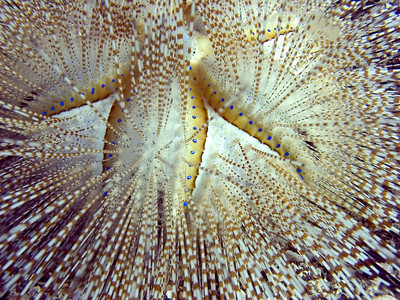 Now can you see the blue spots? 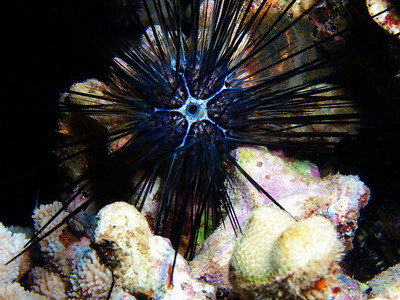 I took this shot with the urchin in motion...another thing that distinguishes this species is that they are very fast. 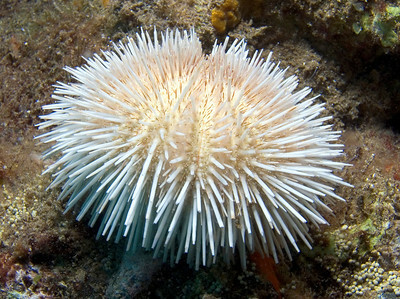 At least, fast for a sea urchin--3" or 4" per second is quick! 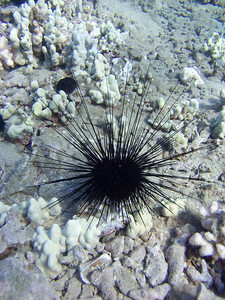 So, yes, I was actually being charged by this urchin--but I held my ground and got the shot. 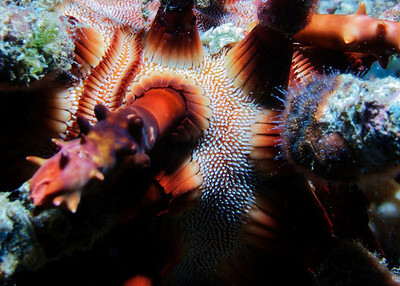 A little wider view, the radial symmetry is amazing. Abstract in b/w, just for fun. 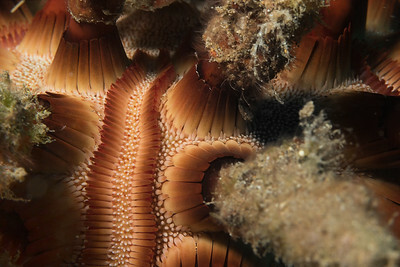 Macro detail of the amazingly intricate structure present in a Rough spine urchin (Chondrocidaris gigantea). 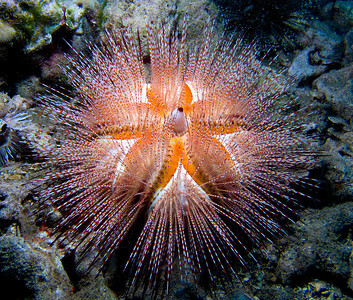 This is a rare one--quite possibly a specimen of Savigny's urchin (Diadema savignyi), and certainly one of the most beautiful echinoderms I've photographed. 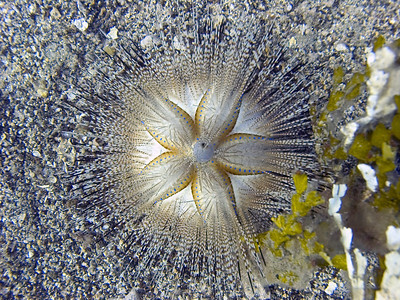 John Hoover was good enough to put me in touch with Echinoderm expert Dr. Rich Mooi who feels this is either a juvenile D. savignyi, or else an unknown endemic species--much more research needs to be done on echinoderms in general and Diadema in particular. 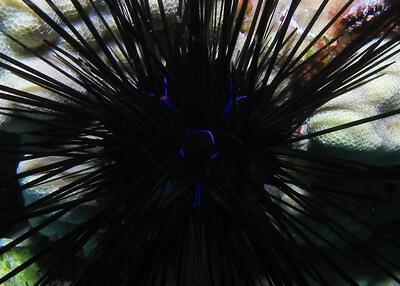 A look at the amazing electric-blue structural color pattern on what is probably an adult Diadema cf. 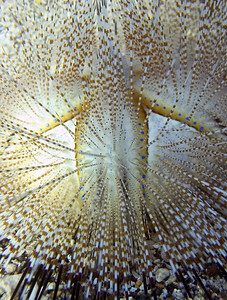 savignyi...because the color is the result of light refracting through organic pigments, this pattern only shows up when the living animal is directly illuminated...I took this straight-from-above picture at the request of echinoderm expert Dr. Richard Mooi, who is attempting a positive ID for me. 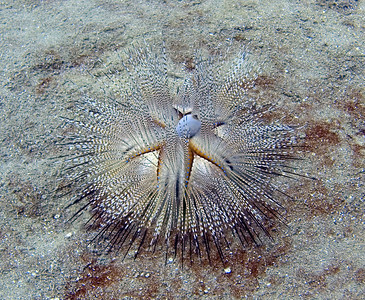 I believe this is a juvenile of the same species. 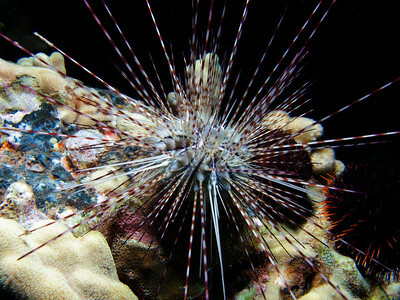 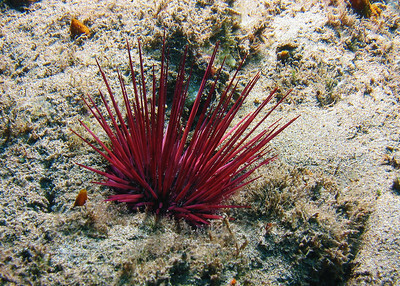 A lovely lavender Needle-spined urchin (Echinostrephus aciculatus). 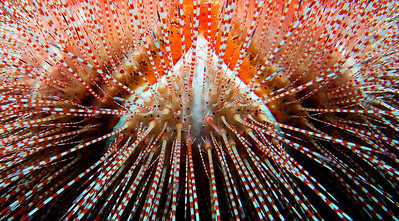 Another beautiful example of the organic color pattern on the test of a Diadema urchin...this pattern is the result of direct bright light interacting with pigments that are only present in the living anima. 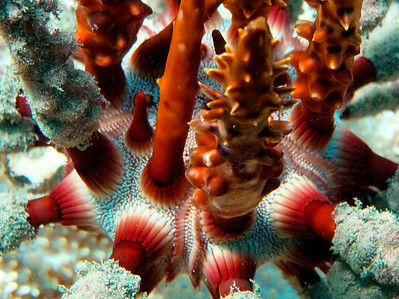 note the small red spots at the end of each electric blue branch--I hadn't seen this exact pattern before, and have passed on this photo to a few people who should be able to tell me more.